The PS4 exclusive from Bend Studio debuts in April. Bend Studio has announced that its upcoming PS4 exclusive Days Gone has gone gold, almost two months ahead of its April release date. 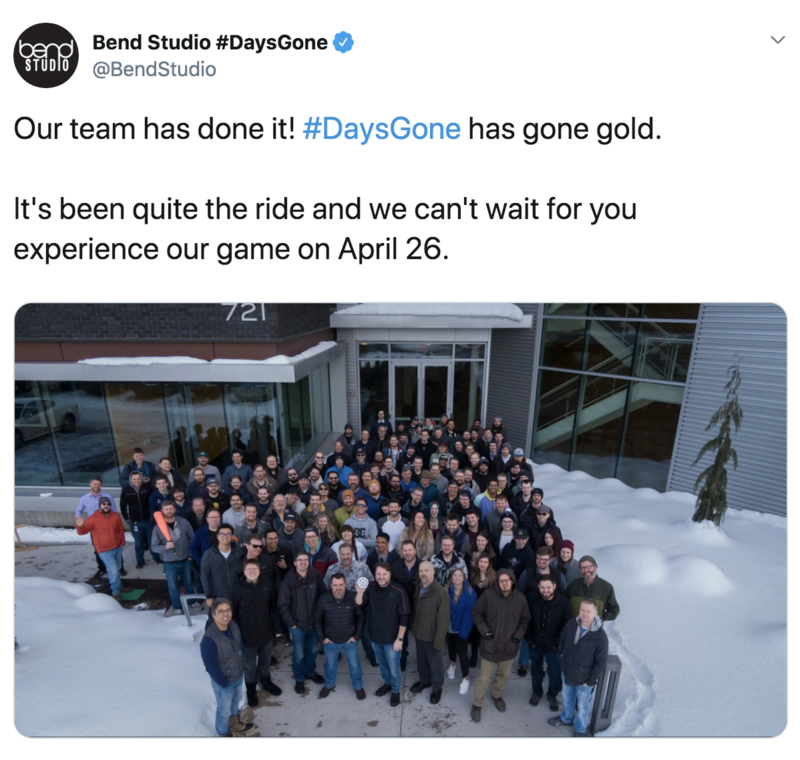 Announced via Twitter, development studio Bend confirmed Days Gone’s gold status in a celebratory tweet and accompanying photo. “Going gold” means principal development on a game has been completed for discs to be sent out for manufacturing. PlayStation and Bend Studio first announced Days Gone at E3 2016, where we first learned about the environment of Days Gone and how protagonist Deacon St. John would interact with it while taking on the main enemies, freakers. Originally intended for a 2018 release, Sony delayed Days Gone into 2019, later receiving a February 22 release date, before seeing a small delay to its current release date, April 26. Most recently, we went hands-on for five hours with Days Gone’s open world and were impressed by what we play. Be sure to check out our discussion below about that hands-on experience, and stay tuned to IGN for more on Days Gone. Jonathon Dornbush is IGN’s News Editor, PlayStation lead, and host of Beyond! Talk to him on Twitter @jmdornbush.